1. [techspeak] A copy of the contents of core, produced when a process is aborted by certain kinds of internal error. 3. Occasionally used for a human rambling on pointlessly at great length; esp. 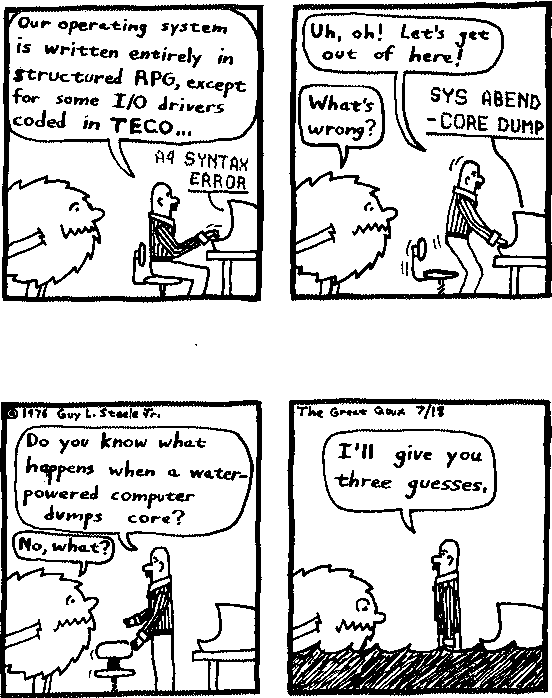 in apology: “Sorry, I dumped core on you”. 4. A recapitulation of knowledge (compare bits, sense 1). Hence, spewing all one knows about a topic (syn. brain dump), esp. in a lecture or answer to an exam question. “Short, concise answers are better than core dumps” (from the instructions to an exam at Columbia). See core. A core dump lands our hero in hot water.